alaTest zebrał i przeanalizował 473 opinii użytkowników z magazynów i stron. Ludziom podoba się cena i przenośność. Funkcjonalność jest również bardzo dobra. Oceniający mają wątpliwości co do kamery. Eksperci oceniają ten produkt na 78/100 a użytkownicy na 87/100. Przeanalizowaliśmy te oceny, wiek produktu i inne czynniki, ale ilość ocenionych opinii dla tego produktu jest zbyt mała, aby obliczyć wiarygodne alaScore™. Tablets are starting to split into multiple categories. Those like the iPad Pro, Microsoft Surface and Google Pixel C that offer a laptop-like experience and those that are, well, cheap. The Asus ZenPad 3S 10 tablet gives you lots of multimedia value for your money. Sharp display. Lightweight build. Loud speakers. Short battery life. Screen is reflective. Asus ZenPad 3S 10 review: Android's savviest iPad contender? Software is full of un-installable apps ; Camera isn't great ; Battery life isn't great. From a hardware perspective, there's not a lot missing when you compare the ZenPad 3S 10 to the new 9.7-inch iPad. The Asus is actually thinner, which may be preferable. Asus has closely followed Apple's lead in name and design of the ZenPad 3S. Can it hold a candle to the iPad and other Android tablets though? The Asus ZenPad 3S 10 is one of the best-designed pieces of tablet hardware I’ve yet seen. But the software made my time with it a chore, and I actively sought to not use it. That isn’t good. The Asus ZenPad 3S 10 has a sharp, clear HD screen and its design is both comfy and cool. The fingerprint scanner adds extra security. Comes with a good amount of storage for its price. The speakers are easy to block when holding in landscape orientation. Games take their time to load. The Asus ZenPad 3S 10 is a fantastic portable video watcher with enough storage to get you through long flights at a reasonable price. Asus ZenPad 3S 10 review: A worthy iPad Pro alternative? 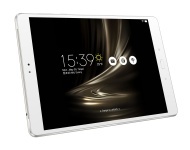 In my eyes, you’d be better off spending an extra £50 and opting for the larger 9.7in version of Samsung’s Galaxy Tab S2, but if you absolutely don’t want to spend more than £300, then the ZenPad 3S 10 won’t disappoint. We review the Asus ZenPad 3s 10 (Z500M), a 9.7-inch Android tablet packing some premium specs and more than a little iPad-style design.